" What a great idea! I bought a 25 pack from your site to run weekly trivia at my pub. Your questions are very entertaining and the room is full on Tuesday nights now." " Hi, I recently used one of your packages for a school trivia night as it had to be held within two weeks your package was a life saver. Valuable time was saved in getting questions and answers so we were able to spend more time on things such as advertising etc. Well Done "
Looking for pub quiz questions? Are you planning to host your own pub or charity quiz night? Then Pub Quiz Help in conjunction with 3 Streets Trivia can provide you with everything you need to run a fantastic trivia night. Simply click the button below to start the quiz wizard which is an easy-to-use tool enabling you to customise and print out your own unique pub quiz package. Click on the button above to get started. A new window will open which takes you to the quiz designer website provided by 3 Streets Trivia. Follow the onscreen instructions and the quiz wizard will take you step-by-step through the process of designing your own quiz package. Select who your target audience is. For example from the UK or Australia - to get the most suitable questions. 3 Streets Trivia provides a large (and ever expanding!) database of questions that have been thoroughly researched and have been tested on live quiz night audiences. Once you're happy with your question selections simply go ahead and complete your purchase, then either download the pack and print it out yourself. Or request the pack to be posted to you. Prices are reasonable, packs are available from as low as �10. Plus no other site allows you so much freedom to customise the quiz to your needs. 3 Streets Trivia offer a 100% refund if you're unsatisfied with the quiz pack. 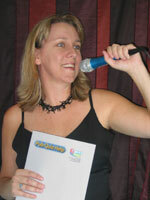 By using the quiz wizard you can download a complete package to make your quiz night a success. Everything you need is included from the questions and the all important answers, to tie-break questions, bonus questions, puzzle pages, a score sheet, answer sheets and even a hints and tips sheet to help you host a great quiz. There is a range of quiz package options to choose from depending on whether you're hosting a single event, a series of quiz nights or an ongoing regular contest. Save time! Instead of the laborious task of writing and checking your own trivia questions simply download a set of well researched questions ready to be used in your own quiz night. You can pick and choose quiz categories and swap any questions you don't like for questions you do. The quiz wizard allows you to produce a tailor-made quiz which you can print off and use straight away. Questions are provided by 3 Streets Trivia who are a well established company of question setters based in Australia. They have a very large database of questions targeted to a variety of geographic regions. The advantage of of using a company like this for compiling quiz questions rather than a "free quiz question" website is the greater choice of questions which have all been vigorously fact checked. Free quiz question websites are full of errors and often, because they get used so much, the audience has heard the questions before. Good Luck!! Once you've got your quiz questions organised why not tell the world about it by adding details of your quiz night to the extensive database of pub quizzes held around the world.